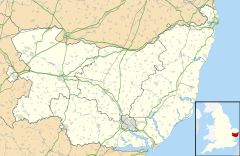 Lowestoft (/ˈloʊ.əstɒft/, /ˈloʊstɒft/ or /ˈloʊstəf/) is a toun in the Inglis coonty o Suffolk. ↑ OS Explorer Map OL40: The Broads: (1:25 000) : ISBN 0 319 24086 X. This page wis last eeditit on 20 Apryle 2017, at 21:43.